Hindustani Music: A tradition in transition is a wide-ranging survey of the North Indian tradition of classical music during the post-independence period. Explicitly, this book addresses music lovers of above-average familiarity with Hindustani music, and their curiosity about its inner workings. It is, however, also a valuable reference for scholars and other writers on music. The book is based on the author's long years of training as a musician, vast experience as an analyst of music, and an observer of the cultural environment. The book is divided into six parts. Part I articulates an Indian perspective on important societal, cultural, economic and technological drivers of Hindustani music. Part II discusses issues pertaining to presentation formats, and the structural and melodic aspects of Hindustani music. Part III deals with the notion of raga-ness, and the world of ragas. Part IV presents comprehensive backgrounders on the four major genres of vocal music — Dhrupad, Khayal, Thumree, and Tappa. Part V features detailed fact-sheets on eight major melodic instruments of the Hindustani tradition — Rudra Veena, Sitar, Surbahar, Sarod, Sarangi, Shehnai, Santoor, and the Indian classical (Hawaiian) guitar. Part VI presents a glossary of words in italics, a list of suggested readings, and an index. 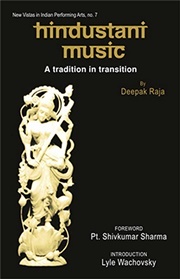 The book makes complex musicological concepts accessible to non-academic readers, and contributes significantly to widening the understanding of contemporary trends in Hindustani music. Written by an author of impeccable credentials as a musician, researcher, and author, this book is a very significant addition to the body of authoritative writing on 20th century Hindustani music.